The U.S. bombing of Libya in support of rebel clients in the spring of 2011 is part and parcel of a sustained policy of military intervention in Africa since at least the mid 1950s. According to a U.S. Congressional Research Service study ((Lauren Ploch, “Africa Command: U.S. strategic Interests and the Role of the Military in Africa,” Congressional Research Service (CRS) Nov. 16, 2010)) published in November 2010, Washington has dispatched anywhere between hundreds and several thousand combat troops, dozens of fighter planes and warships to buttress client dictatorships or to unseat adversarial regimes in dozens of countries, almost on a yearly basis. The record shows U.S. armed forces intervened 46 times prior to the current Libyan wars. ((Richard Grimmett, “Instances of Use of United States Armed Forces Abroad 1798-2009,” CRS 2010)) The countries suffering one or more U.S. military intervention include the Congo, Libya, Chad, Sierra Leone, Somalia, Ruanda, Liberia, Central African Republic, Gabon, Guinea-Bissau, Kenya, Tanzania, Sudan, Ivory Coast, Ethiopia, Djibouti and Eritrea. The only progressive intervention was in Egypt under Eisenhower, who forced the Israeli-French-English forces to withdraw from the Suez in 1956. Between the mid 1950s to the end of the 1970s, only four overt military operations were recorded, though large scale proxy and clandestine military operations were pervasive. Under Reagan-Bush Sr. (1980-1991), military intervention accelerated, rising to eight, not counting the large scale clandestine “special forces” and proxy wars in Southern Africa. Under the Clinton regime, U.S. militarized imperialism in Africa took off. Between 1992 and 2000, 17 armed incursions took place, including a large scale invasion of Somalia and military backing for the Rwanda genocidal regime. ((Edward Herman, “Gilbert Achar’s Defense of Humanitarian Intervention,” ZNET April 8, 2011)) Clinton intervened in Liberia, Gabon, Congo and Sierra Leone to prop up a long standing stooge regime. He bombed the Sudan and dispatched military personnel to Kenya and Ethiopia to back proxy clients assaulting Somalia. Under Bush Jr., 15 U.S. military interventions took place, mainly in Central and East Africa. 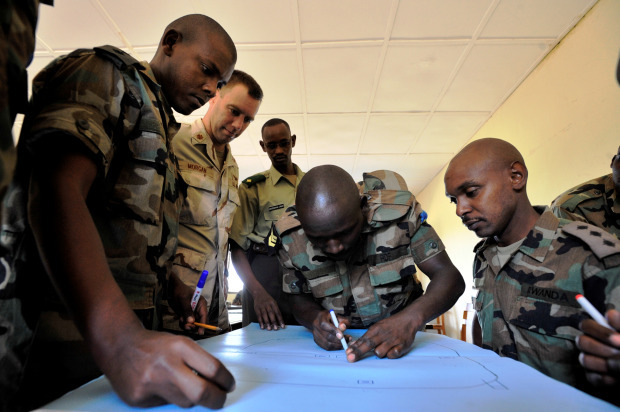 AFRICOM, despite its assigned role as a vehicle for spreading imperial influence, has been more successful in destroying countries than in gaining resources and power bases. Despite Libya’s collaboration with AFRICOM, especially in “anti-terrorist” intelligence operations, Washington mistakenly believed that an easy victory by its “rebel” clients might lead to a more docile regime, offering more in the way of a military base, headquarters and a cheap source of oil. Today the U.S. depends as much on African petroleum as its suppliers in the Middle East. Washington mistakenly believed that an easy victory by its “rebel” clients might lead to a more docile regime [in Libya], offering more in the way of a military base, headquarters and a cheap source of oil. James Petras, a sociology professor at Binghampton University of New York, is the author of more than 62 books published in 29 languages, over 600 articles in professional journals and 2,000 in major newspapers, from the New York Times to Le Monde Diplomatique. Visit him at petras.lahaine.org.